Consent is mediated by power differentials along structural, informal, social, physical, intellectual, and other forces in clearly discernable ways. For grotesque example, if someone has power over one’s potential career trajectory, there is an incentive to feign consent to that person’s wishes, even if they do not explicitly leverage it in any way. The power is embedded even if it’s never spoken. This example is illustrative of the way that power interacts with all of our interactions and agreements, extending to more subtle and also non-sexual contexts as well. But there it is, an excerpt from this blog post, linked to by a social media friend of mine. As far as I can tell, the blog post aims to describe group dynamics within a particular set of social groups called "radical communities." The moral of the story seems to be that, despite the aim of most of these groups to promote equality of human worth, "power differentials" - i.e. informal social hierarchies - still exist within them. On its own, this is a fairly vapid point. Human beings have hierarchical tendencies. What's interesting, though, is its peculiar terminology, which the author jam-packs into each and every sentence. It's as though the author of that blog post is writing in a foreign language. Consider the first six words of the above excerpt: "Consent is mediated by power differentials." In that phrase, there is one "be" verb, one preposition, and three pieces of mindless jargon. As far as the average person is concerned, an equally intelligible phrase is: "Blargh is fruxled by glogg peqrum." It has the look and feel of an English language sentence, but without any insight into what "blargh" and "fruxled" and "glogg" and "peqrum" mean, it is mostly just a collection of nonsense. Consent: The act of stating that one's participation in a situation is voluntary and ongoing. When this word is used within "radical communities," it usually has a sexual connotation, i.e. giving consent is making it explicitly clear to others that one's participation the ensuing sexual encounter is voluntary and welcome. Mediated: I actually had to look this one up. Mediated ordinarily means helping to resolve a dispute between two parties. But not in this case. In this case, mediated means to bring about. Power Differentials: This grandiose-sounding phrase simply means that the people in a social situation have a different status within the social hierarchy. There is a "power differential," for example, between a father and a son, although describing such a relationship in terms of its "power differential" feels like a bizarre concept to most people I know. Putting it all together, we get this: Voluntary participation is brought about by the fact that some people have greater status than others. That makes more sense, but now we have a new problem. The argument made in the blog post is that it's difficult for people to give valid consent in situations where "power differentials" undermine the less-powerful person's autonomy. This phrase, once translated, now means the opposite of what was intended. It says that consent is brought about by these power differentials. The author wants to say that consent happens easiest when people don't feel second-rate; what the author actually said was that their consent is brought about by the very fact that they are second-rate. Oops. The author can be forgiven for making a little mistake with his/her terminology. In fact, any normal person out there would find it totally understandable to get lost in this thick, opaque jargon. But the author doesn't need to be forgiven because everyone within his/her intended audience knew exactly what he/she meant. It's only the rest of us who didn't get it. This brings me to the point of my post today: There is a foreign language emerging among leftists that is utterly senseless to outsiders, which nonetheless dictates everything about their world view. Everything, right down to their ability to participate in a conversation voluntarily. The media keeps trying to tell us that the current state of American politics has been brought about by the fact that social media enables us to spend all of our media-consuming time inside an echo chamber. We only hear ideas and opinions with which we agree, we never question our own side, and we certainly never fact-check it. But of course the media would say this: They want us to consume more media. We're already so saturated by our own echo chamber that we have no time for anyone else's echo chamber. How can the media get us clicking on more articles? By telling us that we need to consume more media in order to save America! That's not going to work. We won't be able to click our way out of this. You can't learn Spanish by deciding one day to read a few Spanish-language articles every morning at breakfast, in addition to reading the newspaper. If you already know Spanish, then reading those articles might do you some good, but if don't know it at all, no amount of exposure to language is going to teach it to you. You need some means of determining the definition of words in order to practice understanding those words. That's why we start with elementary concepts when we learn a foreign language, and gradually build up to reading or watching the news. Think about the implications here. The left is notorious for calling those who disagree with them "ignorant" and for pointing to shortcomings in the education system. This is no mere coincidence. It's not that non-leftists are uneducated fools, it's that they don't even understand the basics of the conversations the left has with itself. How on earth could a farmer in Middle America participate in a conversation about how to "mediate" "power differentials" in order to "empower" "consent?" The farmer isn't ignorant and he isn't a moron. The left is speaking a foreign language that means nothing to him. He doesn't understand it. He's had no exposure to it. He doesn't attend those kinds of schools, and even if he did, he would be more apt to study business, or agricultural science, or engineering, or any of the various other disciplines that do not ever use the new special leftist language. Just because someone doesn't know what you're talking about doesn't mean they have a problem. Growing a beard is a very clear signal in Middle America. Most often, it means that you're preparing to go hunting, i.e. shooting live, wild animals with a gun or a bow-and-arrow. And most often this involves camping, which involves digging trenches and building fires and using tools and... changing a tire. In Middle America, wearing a beard is a signal of the most important aspects of manhood within that community. It's a symbol of having a certain amount of practical know-how that enables people to rely on you to get certain things done. Important things. Things you can't necessarily just call a serviceman to perform. 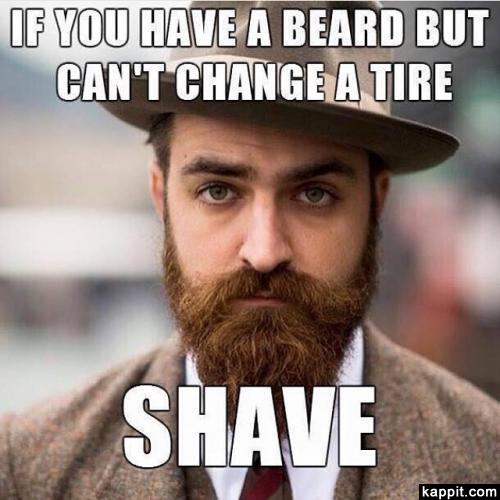 But when a man in Middle America sees a hipster, basically the opposite of bearded Middle American, wearing this symbol, his reaction is to laugh at the hipster for all the same reasons: The hipster doesn't know how to change a tire, i.e. isn't educated. The hipster is the Middle American's version of a moron, someone who doesn't get even the most basic concepts. To use the insufferable language of the leftist community, hipster beards are cultural appropriation, and distinctive cultures don't like to have their treasured symbols undermined and "subverted" through a condescending irony. This is a valid perspective that any leftist can recognize when it occurs to any other group of people. But because this particular group disagrees with a lot of leftist public policy, the left satisfies itself by denigrating a legitimate response to actual cultural appropriation as "male fragility." Can you imagine the audacity of having concocted an internally consistent, but highly exclusionary and - dare I say it? - marginalizing language that even has a special term for negating the criticism of the very people being marginalized? But what am I asking? Of course the left can imagine this. This is one of the core tenets of the belief system their special language is designed to describe. The weird, special language of the left is a uniquely important problem here, because there are legitimate criticisms to be made about the way society operates - yes, including in those small Middle American towns where the word "beard" does not imply anything about a person's sexuality. First, you can't slander someone and then ask them to be nice. You can't make fun of guys for going hunting and drinking Coors Lite and watching football and stuff on the one hand, and then on the other hand expect them to be receptive to a criticism of the way their society behaves. You can either make fun of people and be rude to them, or you can help them change in ways they are comfortable with. You can't do both. That's just basic common decency. Second, you can't convince an English-speaker to have a change of heart by speaking to them in a language they've never heard before, including Chinese, Vietnamese, Gaelic, or the left's weird, special language. Despite everyone's best intentions you just simply won't be understood. This second problem is proving to be really hard for the left. They can't seem to separate the important principles of their world-view from the weird, special language used to describe those principles. It becomes something of an existential struggle: If you try to describe equal rights for women without using the word "feminism," then leftists become incensed. "We need feminism!" Fine, but how are you going to convince people whose only exposure to that term has been a decided rejection of everything they happen to love about the women in their lives, who cook, clean, stay home, have kids, and don't necessarily get a college education? What will you say to people who don't understand your weird, special language? And so, instead, the left too often descends into the first problem: insulting and condescending to the "rural" people who disagree with them. It's hard to make a persuasive case to someone from what we now recognize is a completely different culture, but it's easy to make fun of them for being foreigners. Ordinarily, the left understands this. But just try to get them to admit it if the "foreigner" happens to be white, or male, or Christian. I don't doubt that these whites and Christians and males are privileged groups. But you still need to talk to them.